Recyclingcenter.me helps you find the tire recycling center nearest to you so you can safely dispose of your old and worn tires. Curbside pickup is not an option. You must either recycle them in a designated recycling center, sell them, or have an auto body shop dispose of them for you. Thankfully, there are plenty of affordable and convenient options. You might even be able to make a few bucks with a little luck. This page will answer all of your questions, explain your obligations, and teach you how to save as much money as possible or even turn a profit with your old tires! 1 Why Do I Need to Recycle Used Tires? 3 Where to Recycle Used Tires Near Me? 4.1 Where Can I Sell Used Tires? 4.2 Can you get money for recycling tires? 4.3 Where can I recycle tires for free? 4.4 Can you throw tires away? 4.5 What do they do with old tires? 4.6 How much does it cost to dispose of tires? 4.7 Can you put tires in a dumpster? 4.8 Are old tires toxic? Why Do I Need to Recycle Used Tires? You need to recycle tires because they are not biodegradable and they take up significant space in landfills. This is not only bad for the environment, but it also reduces our ability to eliminate waste, among other issues (we explain below). Hundreds of millions of old tires are recycled every year in the United States. Some are reused to make new products like asphalt for the roads (we explain this further below); some are reused in the home for creative projects; some are even in good enough condition to be retreaded and put back on the road. But why do we have to recycle them instead of just throwing them out? Tires are not biodegradable: Tires can take hundreds or thousands of years to decompose. If you illegally dump them in nature, they’ll release toxins and poison the environment. 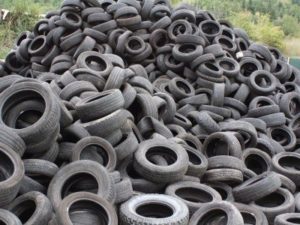 Tires take up a lot of space in landfills: If we just threw tires in landfills, they would fill up too quickly and reduce our ability to get rid of normal waste. Also, tires rise to the top of landfills and attract insects and pests. This makes them a breeding ground for diseases. There so many uses for old tires that there is no reason to simply throw them out. This is our only planet (for now! ), so let’s treat it right. The auto body shop when you purchase new tires. Some will take them off your hands for a few dollars. 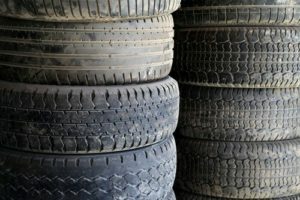 The cost of recycling might even be worked into the price of the new tire or be an environmental tax on the final price. 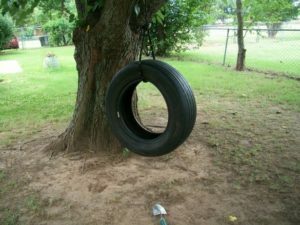 Of course, not all tires become a sad old swing in your backyard. Tires are also burned (a process cal pyrolysis) in an oxygen-free environment so that they can be broke down quickly and safely. If you want to know more you can read this article about the complete tire recycling process. Where to Recycle Used Tires Near Me? Recycling your tires isn’t just doing the right thing, it’s the law in many jurisdictions. Locate the nearest recycling facility and bring your tires in as soon as possible. Most centers charge a nominal fee (usually just a few dollars) to take them off your hands. Check with your local government. There might be a program to pick them up for you, or your state might even have a local tax that covers this cost. Where Can I Sell Used Tires? You can sell used tires to a local auto body shop, online yourself on a marketplace like Craigslist (if they are in good condition), or to a company that recycles them into a new product. This is only if they’re still usable. If they aren’t, you have to recycle them (see below). Generally, selling a used tire only gets you about $10-$25 per tire (depending on their condition), so most don’t even bother. If you have larger truck tires (in good condition), they might fetch you up to $60. You can find companies by searching online and calling them to see how much they’ll pay. Be sure to check the quality of the tire before and do your research. The more you know, the better you can haggle with a shop or potential buyer online. Note: Recycling old tires can actually COST you money, so factor that into your profit as well. For example, if it costs you $10 to recycle a tire but instead you sell it for $3, then you made $3 instead of spending $10, so you just netted $13! Can you get money for recycling tires? No, you generally can’t get money for recycling tires. Since tires are banned from landfills, there’s a public cost for getting rid of them. However, it is possible to scrap the aluminum rims for a bit of money. Some companies will take them off your hands for $1-3 each and turn them into asphalt, but this usually ends up costing more money than it’s worth. Theoretically, you can make good money if you have a large capacity, but as an individual, it’s extremely difficult. Where can I recycle tires for free? Usually, you can only recycle tires for free if you are buying new tires and the auto shop takes the old ones off your hands for you. It’s important to know that there are almost NO FREE ways to recycle tires. 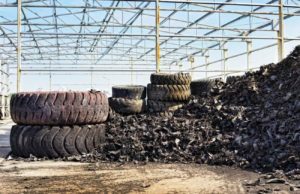 There are many specialized tire recycling centers in every area of the country, but most will charge a fee. Be sure to check state laws. There could be a tax-funded program in your state. Instead of trying to recycle them, why not put them to good use around your home? Can you throw tires away? No, you cannot throw away whole tires. Tires cause serious environmental damage and serve as a breeding ground for pests and disease. That, and they take up valuable landfill space and are not biodegradable. They are no longer allowed in landfills (depending on where you live), so you cannot put them on the curb. Some states do allow shredded tires in landfills, and some others allow you to throw them in the landfill for a fee ranging from $5-$10. Most municipal recycling programs also do not accept tires right off the curb, though you could check with your city. If you want to get rid of old tires, they must be recycled or sold. You could always just leave them in the corner of your garage with the rest of the things you swear you’ll get to one day! What do they do with old tires? Old tires can be used for a surprising range of new products, but they are most commonly turned into asphalt or Portland cement. However, new efforts are being made to reuse old tires in the making of new tires or garden mulch. Some tires are even turned into fuel. Still, the majority of tires are burned, a pressing environmental issue as we move further into the 21st Century. How much does it cost to dispose of tires? It costs anywhere from $1-$10 to dispose of old tires depending on the method you choose. Some companies may come to pick them up for a small fee, and some municipalities allow you to throw them in landfills for $5 or $10. There are also specialized recycling centers that accept old tires for just a few dollars. Some states (for example, Maryland) incorporate a tire recycling fee into the purchase of every new tire. Check for actual costs in your local area. Can you put tires in a dumpster? No, you cannot put tires in a dumpster under almost any circumstance. There are specialized services or recycling centers that handle the disposal of tires. They are almost always banned from landfills and curbside pickup. No, old tires are not toxic. At least not immediately. Tires take an extremely long time to wear down. In fact, that’s the main reason they are such an environmental issue—they stay in landfills A LONG TIME. It’s true that old tires release toxic chemicals, but it takes an extremely long time.